Should you use a Facebook Group, Facebook Page or personal profile page for your brand? This post is part 1 of 3 explaining the details of each and why you should create one over the other. Don’t have a Facebook Group yet? See my post on How to Create a Facebook Group. Creating a Facebook group has changed over the years, but at the time of this post, a group has the following attributes. – If the group is public, anyone can join. The image below was posted in a group called “iPhone Groupies,” that as of 12/15/12 at 10:08am has 83 members. This was posted in the group 17 hours prior to that time and only 10 people have seen it. Don’t be fooled by the number 10, although this post in the group “iPhone Groupies” was seen by 10, that does not mean that they read it or engaged with it. That just means that this post appeared in the newsfeeds of 10 people. Upon initial setup, the default setting in a group is that notifications will be turned on. 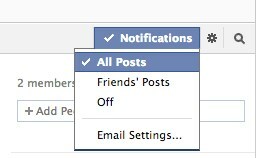 Which means that anytime someone posts in this group, members will receive a notification. If you are posting everyday, those alerts are seemingly going to annoy your audience. Group members may not know this, but they have options when it comes managing their alerts. Keep in mind these settings are intended to be used by individual users and are not settings for the entire group. Facebook groups are not suggested for managing your brand as the only analytics you can measure are how many have seen the post, not engagement rate, virility and reach. 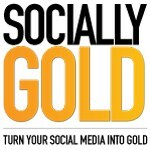 Are you looking to create a social media strategy, but don’ have enough time? Find out how to do it in under 30 minutes a day here. Stay tuned for posts on Facebook Pages and personal profiles.